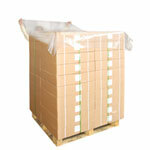 An ideal addition when wrapping pallets, Lay the polythene sheet over the top of the pallet prior to pallet wrapping. Keeps the goods dry and dust free. A good size cover 1800 x 1800mm x 15mu, With a massive 300 covers per roll. Please click on the below for full details.